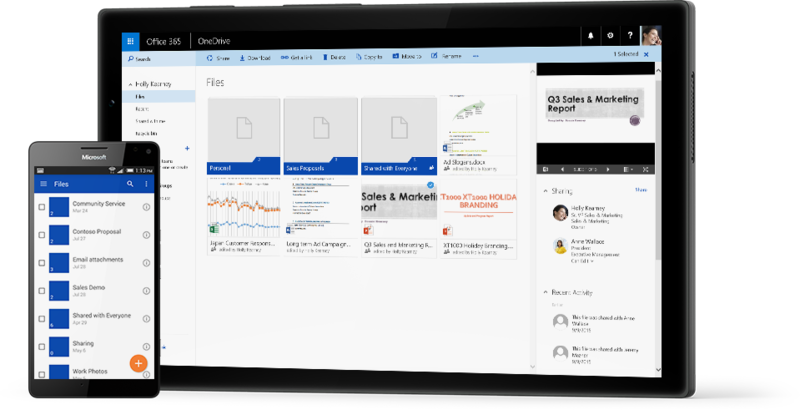 OneDrive for Business is available as a standalone service, or you can get it as part of an Office 365 plan that includes Office applications, business-class email, online meetings, and other services. Get more done on your phone and tablet with the OneDrive for Business app for iOS, Android, and Windows. Sync files across devices and access them anywhere, even when you’re offline. You can flag one or more files for offline access and then open them when you’re not connected to the Internet, ensuring access wherever you are. Easily share your files with colleagues, business partners, or customers. You control who can see and edit each file. Coauthor and collaborate on documents with ease, using Word, Excel, and other familiar Office applications. Advanced DLP capabilities allow you to identify, monitor, and protect sensitive information. Rights Management Services enables you to restrict access to documents to specific people and to prevent anyone else from viewing or editing them, even if they are sent outside the organization. Use In-Place Hold to preserve deleted and edited documents. What plan works best for you? Chat, call or email with real human beings and discuss your cloud ambitions. It’s free and we’re great conversationalists! Try Office 365 for free today. Let us know what version you’re interested in and our cloud services team will get you started with a 30 day free trial of Office 365! *Hypertec does not release your information to third party services. Any contact information provided is used for business purposes only.